I hope you’ve been keeping up with my three-part series dedicated to repairing and powering up your aging brain. So far, you’ve learned about several foods and nutrients that play a large role when it comes to keeping your brain younger, more alert and free from mental decline as you age. Today, in the final issue of my series, we’re going to dig into a few more things that can really ramp up your mental prowess – and keep all of your important memories intact for years to come. Now, the brain is a tricky thing. One minute you’re talking about the movie you watched last night, the next minute you can’t remember the name of the movie. Or, maybe you run into a neighbor at the store. But, no matter how hard you search your memory, you can’t come up with his or her name. Somewhere along the way, your steel-trap memory has turned into a sieve. It’s hard not to worry if these “senior moments” are just the beginning of mental instability, dementia or Alzheimer’s disease. That’s why the news I’m bringing to you today is crucially important to your mental health. It will help you ward off Alzheimer’s long before it has time to wrap its memory-robbing fingers around your brain. This is really important news, especially if you’re in your 50s, 60s or 70s. Because it gives you time to slow down – maybe even halt – the progression of this brain-wasting disease. In other words, it’s time to stop worrying and take action to power up your aging brain. And, I’ve got just the action you need to keep your brain cells firing at full speed for years to come. I don’t have many patients who say they exercise because they actually want to. Instead, they usually say they have a specific goal in mind. They want to protect their heart, ward off diabetes, improve their lung health or lose weight. But, there’s one more reason you should be putting your body into motion every single day. Getting plenty of exercise is one of the best things you can do to ramp up your brainpower, prevent dementia and beat down your risk of Alzheimer’s disease. It can make your aging brain young again. Regular exercise reduces the buildup of beta-amyloid plaque. And remember, this is a key factor when it comes to the development of Alzheimer’s disease. Exercise even helps people who carry the gene variant (APOE-e4) that puts them at greater risk of Alzheimer’s. And, very importantly, exercise improves cognitive functioning by increasing the production of brain-derived neurotrophic factor (BDNF) and other neuroprotective genes in the hippocampus. That’s the seahorse-shaped area in the brain that plays an important role in consolidating short-term memory into long term memory. Plus, older people who get more exercise have less brain shrinkage than those who are more sedentary. In fact, people who get moderate exercise in midlife have almost a 40 percent reduced likelihood of developing cognitive impairment. 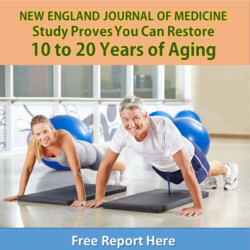 Even if you start exercising later in life, it can reduce the odds of mental decline by more than 30 percent. So, start moving your body more frequently. It’s probably the single most important thing you can do for your long-term mental health. I recommend walking for 30 minutes, twice a day. Toss in a couple of short bursts of intensity for good measure and your brain will be all the happier for it. There are other things you can do, too. Take the stairs instead of the elevator. Park in the furthest spot at the mall, not the closest. Try bicycling, yoga, dance classes, strength training and swimming. I’m 100 percent behind anything that gets you moving. As I mentioned, getting plenty of physical exercise is one of the most important things you can do to power up your aging brain. However, your brain also needs plenty of mental exercise to keep its cells communicating properly with one another. Learn something new. As adults, we tend to learn only what we need to get by. It’s not like when we were kids and studied all day at school, then still had to do homework before bedtime. All that learning kept our brains active and alert. You can revive that natural learning process by studying a new area of interest, signing up for adult education classes, or even learning a new hobby. For example, you could study a new language, take up golf or learn how to play a musical instrument. Change things up. Sitting in front of the TV (remember when we called it “the idiot box) or computer screen is guaranteed to numb your brain. Make an active effort to get off the couch and do something different every day. Take a walk to explore your neighborhood, drive to the local art museum and investigate the exhibits, or stop by the library to pick up a book. The key is to do something different – and stimulating – every single day. Talk to everyone you meet. Meeting and talking with new people offers the exchange of new ideas and a more active lifestyle. So, don’t be shy. Talk to the cashier at the store, the people standing in line with you, and anyone else you encounter. Ramp up your math skills. Instead of using a calculator, try doing calculations in your head. You knew how to do it when you were a kid, so there’s no reason you can’t do it now. Practice memorizing. Keep your mind sharp by challenging your memory regularly. For example, put your grocery list in your pocket while you’re at the store and see if you can remember to pick up everything on the list. Then, before checking out, review your list to see how well you did. Take up crossword puzzles or other challenging games. The great thing about puzzles and word or number games is that every one of them is different, so there’s always a new challenge. Even if you’ve never picked up a crossword puzzle before, you can get started on the easy ones and work your way up to the harder puzzles. They’re fun and entertaining… and you might even learn something new. Eat well. Nourish your body with compounds that make your brain cells flourish. And, get plenty of mental and physical exercise to keep your brain younger, healthier and firing on all cylinders well into old age. Landau SM, et al. “Association of Lifetime Cognitive Engagement and Low β-Amyloid Deposition.” Arch Neurol. 2012 Jan 23. University of California – Los Angeles Health Sciences. “Memory improves for older adults using computerized brain-fitness program.” ScienceDaily. June 2013. Valenzuela MJ, et al. “Lifespan mental activity predicts diminished rate of hippocampal atrophy.” PLoS One. 2008;3(7):e2598. Singh-Manoux A, et al. “Leisure activities and cognitive function in middle age: evidence from the Whitehall II study.” J Epidemiol Community Health. 2003 Nov;57(11):907-13.